Developing effective reading and writing assignments helps students retain and critically think about course content. 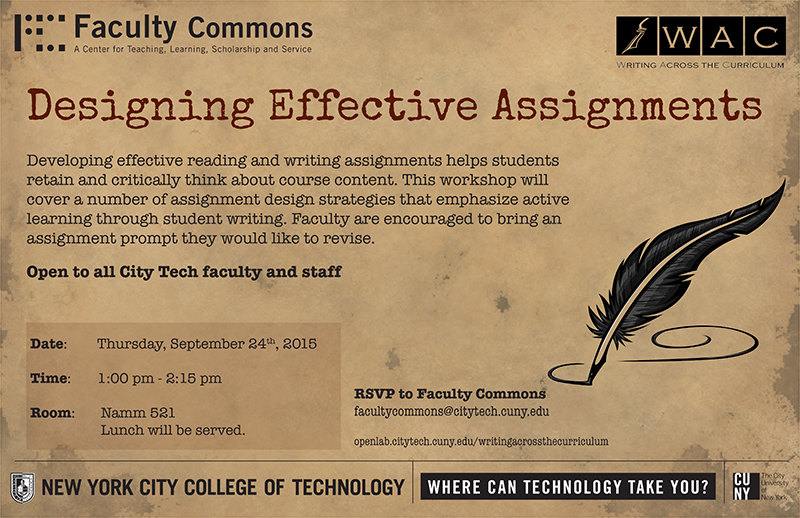 This workshop will cover a number of assignment design strategies that emphasize active learning through student writing. Faculty are encouraged to bring an assignment prompt they would like to revise. This workshop is the first of four faculty professional development sessions this fall devoted to writing pedagogy as part of the writing intensive certification program. If you are interested in learning more about the certification program, visit our website, openlab.citytech.cuny.edu/writingacrossthecurriculum/, or please contact one of the WAC coordinators, Rebecca Devers (rdevers@citytech.cuny.edu) or Samar ElHitti (SElHitti@citytech.cuny.edu).